The following table summarizes the best available (and likely incomplete) information concerning the composition and disposition of these forces circa June 1999. The disposition and composition of the US forces was probably about as close as contemporary OPSEC limitations would permit, and with the exception of a few squadron assignments had about the right number of the right types of aircraft at more or less the right locations (though the bed-down locations of newly deploying aircraft at the time would require further clarification). This unofficial estimate was not and could be authoritative, but rather it represents a "best guess" assessment at the time based on a variety of official and unofficial sources, and was subject to revision and update. Initially US Air Force elements were disposed among 16th Air Expeditionary Wing and the 31st Air Expeditionary at Aviano Air Base, Italy; the 86th Air Expeditionary at Ramstein Air Base, Germany; and 100th Expeditionary Air Refueling Wing at RAF Mildenhall, United Kingdom. In early May 1999, reflecting the continued buildup of forces and the need to retain effective span of command, additional Expeditionary Wings were formed, largely from units previously assigned to the 16th Air Expeditionary Wing. 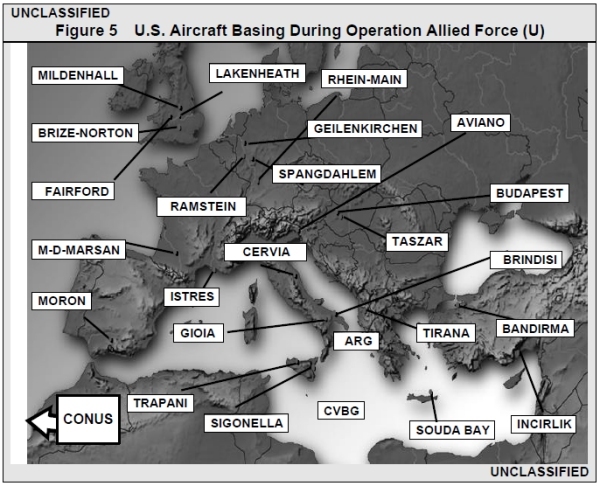 The number of aircraft indicated reflects allocations to the Allied Force Air Tasking Order, rather than the total number of aircraft in theater or associated with a particular unit. Aircraft shaded in grey are committed but not yet deployed. Aircraft shaded in gold are deployed in-theater, but not committed to Allied Force. In some instances, these aircraft remain allocated to Operation Deliberate Forge activities. 7 C-130 TRANSCOM Rhein Main ? 8 KC-135 141st Air Refueling Wing ?? 7 KC-135 151st Air Refueling Wing ? ?